Why do we need a European Constitution when we have treaties? Why should we want further European integration? Read how a Constitution will make us more democratic, more transparent, and stronger. 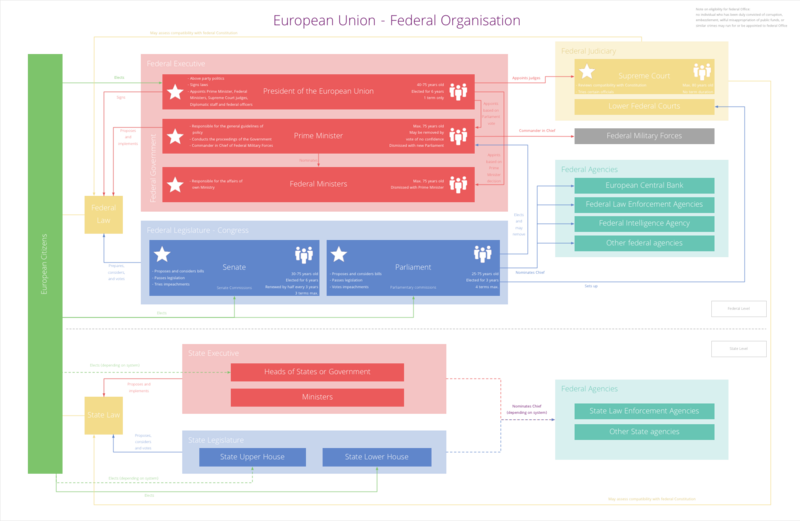 Get a glimpse of what a new federal European Union would look like under its Constitution. Reformed institutions, clear roles, and regular elections for a more democratic Union. Dive into the European Constitution and discover how much we can build in such a short document. Six articles, twelve pages in total for a solid foundation. Detailed comments highlight the most important underlying ideas and principles. Want more information? Get most of your questions answered in this clear and detailed Q&A. Click on the topics that you are interested in and see how they are included and promoted in the Constitution. Specific article references are provided, as well as links to extra information in the Q&A. Democracy is about dialogue and understanding. Share your comments and ask your questions using the form below. Fundamental rights are the bedrock of democracy and are the first thing we should guarantee and fight for. 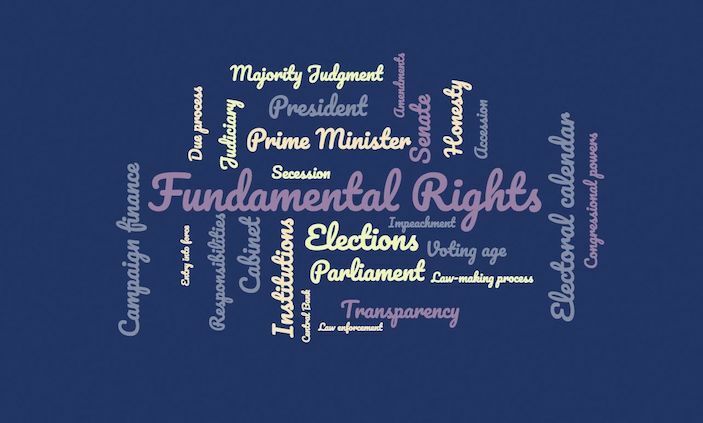 For this reason, fundamental rights are the very first element in the European Constitution. Article 1, Section 1 lists fundamental rights and places them above all. Our Q&A asks: how can I be sure that my rights are protected under this Constitution?. Read what we reply. Great power means great responsibilities, and the Constitution balances a citizen's rights with responsibilities. Read more in Article 1, Section 2 and in the Q&A. How do we choose our elected officials? Voting is what brings legitimacy to democracy and elections are the key moment we choose the people who will be representing us. This means we must be very careful in designing our electoral process. Elections should be periodic and not too far apart – so as to reflect the people's will – but not too frequent or impromptu – so as not to disrupt regular political life. Campaigns must also be kept short and with strict limits on campaign financing. Article 2, Section 2 and Section 3 detail election modalities for Parliamentarians and Senators. Article 3, Section 1 and Section 3 present the same for the President and the Prime Minister. Article 5, Section 1 imposes general limits on eligibility, including for convicted individuals and age limits, and limits to campaign financing. How do the federal elections work? Why can I not vote for my Prime Minister? How do elections differ from current ones? Who can become an elected official? Why can I not run at 80? Beyond elections, read about what our new federal institutions would look like. Parliament is arguably the most important institution, as it is one of the two houses of Congress and the one most locally elected. Parliamentarians are therefore the federal officials closest to the citizens, and represent their interest and grievances while keeping the general interest in mind. Article 2, Section 2 establishes Parliament and details the voting process, conditions of eligibility, apportionment of parliamentary seats across the Union and constituencies within States, the filling of vacancies, and the election of certain parliamentary officials. Article 2, Section 4 adds details for congressional elections and recess, while Section 5 provides guiding rules of both houses of Congress. who can become a federal elected official. Beyond Parliament, read about all institutions of the federal Union, the legislative process, and what the powers are at the federal and State levels. A major safeguard for democracy and the rule of law is when citizens have to ability to know what they officials do and discuss. Transparency is built in this Constitution to ensure that every citizen, as well as the watchful media, are able to fully partake in the political process. As early as Article 1, Section 2, Congress is tasked with ensuring that elections are transparent, especially campaign finance, as detailed in Article 5, Section 1. In Article 2, Section 5, each house of Congress is required to hold a public record of its proceedings. Section 6 states that bills submitted to a vote must be made public for 72 hours before the vote, and that the nominal results of the vote be made public. Section 8 requires the Treasury to record all its uses of public funds. In Article 3, Section 4, Federal Ministers are required to conduct the affairs of their ministry with due concern for transparently. Finally, Article 5, Section 1 requires all public officials to publicly disclose all sources of income, in order to prevent conflicts of interest. Turn to our Q&A to read more about how we ensure accountability and transparency. Transparency also links to the efficiency of our institutions; read more about how we make the Union less bureaucratic. In order to provide for common defence and security, and ensure the rule of law, the Union will need federal law enforcement agencies. Congress is empowered by Article 2, Section 7 to "provide for the common defence and public safety, including across State lines and through the necessary federal law-enforcement agencies". The agencies in question and their prerogatives are left for Congress to define. In any case, as operating under the Constitution, they must respect fundamental rights and due process. For more details, read our Q&A entry on other federal institutions. 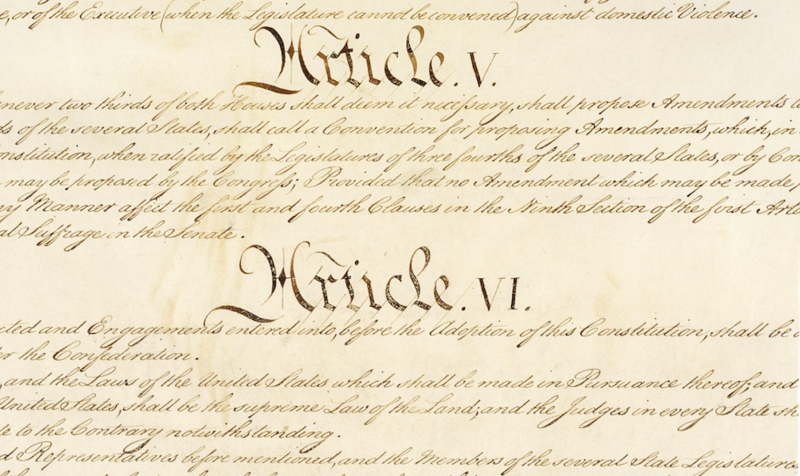 Beyond law enforcement, read more about fundamental rights, the institutions contained in the Constitution, powers at the federal and State levels, and why the Constitution is so short. Congress is the legislative body and is therefore entrusted with drafting and adopting laws. Both houses have the power of legislative initiative and can propose and discuss bills. Specific regulations are put in place to ensure the transparency of the law-making process. The full legal procedure for the adoption of laws is found in Article 2, Section 6. Overall, both Houses must agree and the President must sign the agreed text into law. 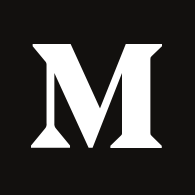 The section also includes a seventy-two-hour delay between the official publication of the submitted text and the vote, in order to prevent last-minute changes and late-night votes. Turn to our Q&A to read more about how we pass laws. To know more about how our proposed legal process differs from current EU law-making, have a look at Institutions in brief. Who is of voting age? The voting age determines citizens' legal entrance in the active decision-making process of the Union. Apart from citizens legally deprived of their voting right, age is the only criteria for the ability to vote; all other forms of discrimination are explicitly forbidden. Article 2, Section 8, by way of forbidding any discrimination for citizens above an age limit, fixes that limit at eighteen. Any further limitation by federal or States institutions is forbidden. By virtue of Article 1, Section 2, voting is also a responsibility, a duty, for the citizen; voting is therefore allowed at eighteen and simultaneously made compulsory. Turn to our Q&A to read more about who can vote in federal elections and an explanation as to why voting is compulsory. 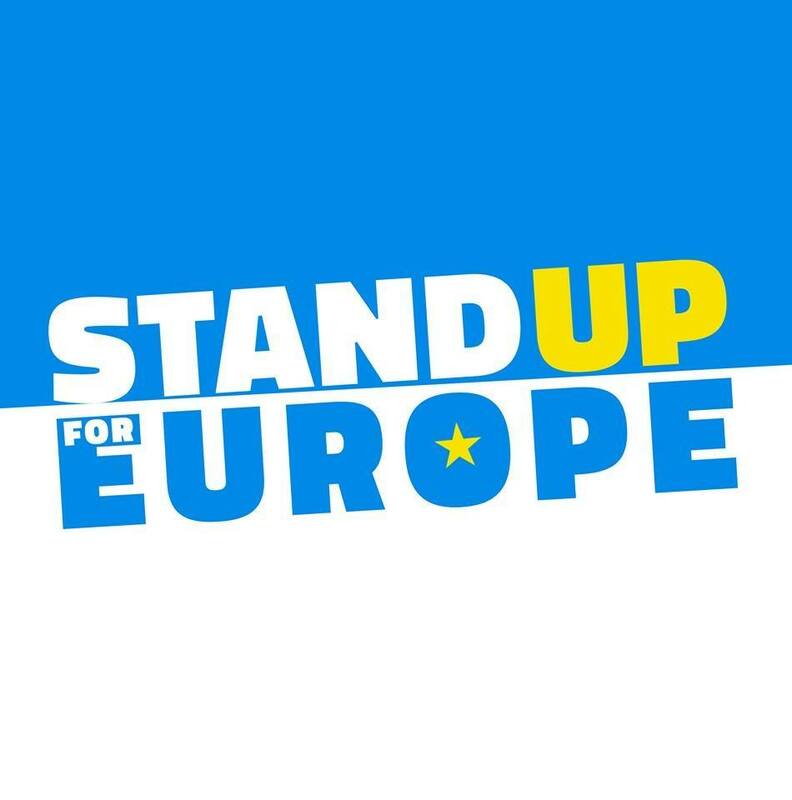 The ability to vote for EU officials is front and centre in the reasons why we need a new Union and the Constitution to support it; read more about why we need EU reform. Generally speaking, impeachment is the procedure to remove an official from his position. The term actually covers to separate events. The first is impeachment per se, whereby a vote is made on whether there are grounds to consider the official's removal (the "article of impeachment"); if the vote is positive, the official is impeached. He must then stand trial based on the articles of impeachment; if found guilty, the official is convicted of impeachment and removed from Office. Article 2, Section 2 gives Parliament the sole power of impeachment, meaning only Parliament can vote on articles of impeachment. Section 3 gives the Senate the sole power to try impeachments, meaning only the Senate can try someone who has been impeached. If convicted, the official is removed from Office. When the President or Prime Minister is tried, the Chief Justice of the Supreme Court presides the trial. Article 4, Section 3 asks Congress and the judiciary to come together and define impeachable offences. For more details, read our Q&A entry on removing the government or officials from Office. Read about institutions contained in the Constitution, the judiciary, and powers at the federal and State levels. While we favour coming together under common institutions, the Union must be consented to, and States must have orderly ways to secede from the Union or territories from their State. Article 5, Section 4 allows the secession of territories from their State and, separately, from the Union, following a three-fifths majority from their population in a free and fair referendum. Territories that have seceded from their State become territories of the Union and must apply to State status and receive approval from Congress with a three-fifths majority. The modalities of secession must be negotiated, depending on the situation, with State authorities or with Congress before secession takes effect. For a more detailed discussion of the modalities of accession and secession, read our Q&A entry on accession to and secession within or from the Union. 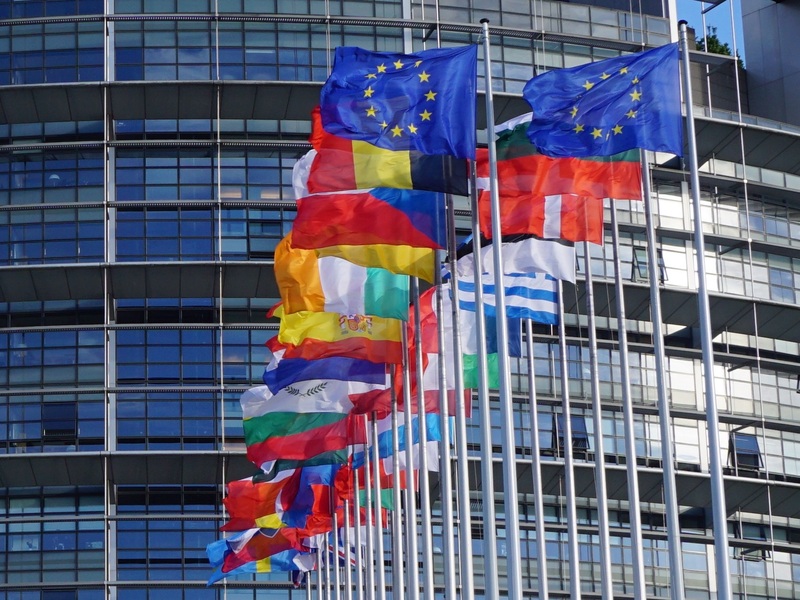 Beyond accession and secession, read more about how we can manage to come together in one Union and what would happen for current EU member States that would oppose the idea of a federal EU when others want it. In a federal Europe, as in most parliamentary systems, the government is led by a Prime Minister stemming from Parliament. The Prime Minister is responsible for the overall implementation of policies and heads of the Cabinet of Federal Ministers. He is also the commander-in-chief of the armed forces. As in many countries, the Prime Minister is elected indirectly, as he is elected by directly-elected Parliamentarians. This is to prevent the imposition of a truly unwanted Prime Minister, though, in practice, the Prime Minister will be the head of the leading party or coalition in Parliament. Article 3, Section 3 establishes the position of Prime Minister and gives details on his election, appointment, and criteria for eligibility. Article 3, Section 4 lists the prerogatives of the Prime Minister and his Cabinet of Federal Ministers. why we cannot vote for directly the Prime Minister. Beyond the Prime Minister and his Cabinet, read about all institutions of the federal Union. In a federal Europe, as in most parliamentary systems, the Union is led by a President with limited involvement in policy-making. The President has an important role with regards to ensuring the respect of the Constitution and is meant to be a fair interlocutor. As such, the President is directly elected by citizens, in order to ensure that he serves the citizens and not any political party that would have nominated or elected him. Article 3, Section 1 establishes the position of President and gives details on his election and criteria for eligibility. Article 3, Section 2 lists the prerogatives of the President, including the conclusion of treaties, the nomination of certain officials, and addressing Congress. Beyond the President, read about all institutions of the federal Union. Our voting systems are rarely a subject of debate. We take them for granted and, when discuss change, it often varies between uninominal majority and some form of simple proportionality. Our Constitution adopts an innovative form of voting: majority judgment, which allows voters to grade all candidates and thereby express a much richer opinion than the selection of one name. Majority voting is resistant to biases and paradoxes of majority voting, prevents strategic voting, encourages honesty, and depolarises the political debate. Majority judgment is supported for all federal elections: that of MEPs (Article 2, Section 2), Senators (Article 2, Section 3), and the President (Article 3, Section 1). Along with elections taking place on the same day, a unique voting system contributes to simplifying elections. Majority judgment is also supported for the election of the Prime Minister by MEPs (Article 3, Section 3) and of congressional officials (Article 2, Section 2 and Section 3). For a more detailed presentation of majority judgment, read our Q&A entry on majority judgment for federal elections. To get fully acquainted with federal elections, catch up on how federal elections work and how they differ from current EU elections. The Constitution is designed to be durable and flexible; it is based on the US Constitution, which has stood the test of time, and goes to great lengths to address its deficiencies and include robust provisions for democracy, transparency and efficiency. However, it still contains a mechanism for amendments in order to remain open to change. Article 6, Section 1 provides for the adoption of amendments to the Constitution with a two-thirds majority. Amendments enter into force when ratified by the legislatures of two thirds of the member States. Amendments cannot deprive citizens of their fundamental rights, nor deprive a State of its equal rights. A grace period of 3 years is also provided for, in order to let new institutions develop. For more details, read our Q&A entry on how we can change the Constitution. Beyond changes to the Constitution, read more about why the Constitution is so short and why it is probably not making headlines. The Senate is one of the most important institutions, second only to Parliament. Senators are elected for twice as long as Parliamentarians and represent the interest of the citizens as members of their respective States. Each State has two Senators, which counterbalances proportional apportionment in Parliament. Article 2, Section 3 establishes Senate and details the voting process (including election of Senators by half every three years), conditions of eligibility, the filling of vacancies, the election of certain parliamentary officials, and the Senate's role in impeachment procedures. Article 2, Section 4 adds details for congressional elections and recess, while Section 5 provides guiding rules of both houses of Congress. Beyond the Senate, read about all institutions of the federal Union, the legislative process, and what the powers are at the federal and State levels. Honesty is not something we would associate with a Constitution nor, unfortunately, with politicians. Yet, in a system based on the public trust, honesty is essential. Honesty is encouraged in three ways: by designing institutions with clear transparency requirements, by limiting the positions officials can accept or the money they can receive, and by mitigating risk. For this last point, Article 5, Section 1 prevents individuals convicted of certain crimes to run for Office, empowers an ethics court of the judiciary to assess the compatibility of positions or income with public Office, and mandates both houses of Congress to revoke their member's immunity when necessary for the public trust. Turn to our Q&A to read more about how we can help ensure honesty and how we ensure accountability and transparency. Honesty, accountability and transparency are core reasons why we need constitutionally-entrenched principles and regulations; read more about why we need EU reform. While the Union should not grow indefinitely, it still has room for expansion and we must have a mechanism for accepting countries as new member States, provided they adhere to the principles and values of the Union. Article 5, Section 4 allows the accession of new States into the Union by a two-thirds majority from Congress. Territories of the Union – which are part of the Union but do not hold State status – can become full-fledged States with a three-fifth majority from Congress. The timing of elections is a delicate topic. Elections should be periodic and not too far apart – so as to reflect the popular will. At the same time, they should not be too frequent or impromptu – so as not to disrupt the regular political process and turn political life into constant elections. We therefore propose to hold elections on a single day, every three years. Campaigns must also be kept short and with strict limits on campaign financing. Article 2, Section 2 and Section 3 detail election modalities for Parliamentarians and Senators. Article 2, Section 4 emphasises that elections of Parliamentarians and Senators must take place together, and on the same day throughout the Union. Article 3, Section 1 adds that the Presidential election that take place on the concurrently with Congressional elections. As it defines our institutions, a Constitution empowers government bodies with certain prerogatives. These prerogatives must be clearly defined, provide flexibility wherever necessary, and have limits. In particular, in a federal system, the federal and State levels must have their respective areas of power; the continued tension between federal and State prerogatives is an integral and healthy part of federal life and the public debate. Congressional powers are listed in Article 2, Section 7. This list is extensive, as many topics go beyond the State level. Congress therefore has the power to act, but subsidiarity remains the cardinal principle and each issue must be, in practice, legislated at its most appropriate level. Therefore, simply because Congress could act, does not mean it should always act. Explicit limits to congressional powers are provided in Article 2, Section 8. Our Q&A also discusses powers at the federal and State levels under the Constitution. Read more about democracy, the separation and Brussels not controlling everything. A Constitution does not aim at fixing all points of legislation, and the precise modalities surrounding the financing of political life and campaigns are best found in regular law. However, the Constitution can and does set guiding principles, including a limit on federal campaign durations and mandating Congress to strictly limit the use of money for political campaigns. This aims at limiting politicians' reliance on and submission to wealthy private interests, and at ensuring a level playing field for all those willing to participate in elections, wealthy or not. Article 5, Section 1 directly places a sixty-day upper limit on the duration of federal campaigns. It includes provisions for Congress to legislate on limitations for campaign finance. Check out our Q&A to read more about how we ensure honesty. Beyond limiting the influence of wealthy private interests in elections, read how the European Constitution aims at bringing power back to the people and limiting bureaucracy. The Constitution aims at replacing the treaty-based system that governs EU legal frameworks. It is open to all EU member States and will become law when it enters into force. Article 6, Section 3 states that the ratification of the Constitution by the legislatures of three-fifths of the States of the European Union will be sufficient for its entry into force for the ratifying States. It will progressively become law in other States as they ratify the document. For more details, read our Q&A entry on when the Constitution enters into force. Beyond entry into force, read more about what happens in cases of opposition to the Constitution and provisions for accession and secession. Due process is the respect for the rule of law, as it applies for State institutions in relation to citizens. Ensuring due process is therefore a legal requirement for the State to respect all fundamental rights. Just like fundamental rights are the first element of the Constitution, due process is a core principle. Article 4, Section 4 required the respect of due process and imposes limitations on legal proceedings. Likewise, Article 2, Section 8 and Section 9 explicitly prevent both Congress and States to suspend or limit fundamental right, except in very limited circumstances. Furthermore, Congress is constitutionally tasked with defending and promoting these rights in Article 2, Section 5 and Section 7, and so is the Government in Article 3, Section 4. Finally, as stated in Article 6, Section 1, no amendment can deprive citizens of their fundamental rights. Our Q&A also details how fundamental rights are protected under the Constitution. Read more about what kind of reforms we need. The judiciary, third branch of government, ensures the respect of the law and the compatibility between various legal levels, including the compatibility of State law with federal law, and that of State and federal law with the Constitution. Article 4 establishes the judiciary: Section 1 creates a Supreme Court, Section 2 defines its powers, Section 3 tasks the Supreme Court and Congress with adopting impeachable offences to improve public trust, and Section 4 limits the Court's powers for the upholding of fundamental rights and due process. Our Q&A details the institutions contained in the Constitution and explains how fundamental rights are protected under the Constitution. The role of the judiciary concerning State and federal law speaks to the new legal system we need; read more about what kind of reforms we need. From decrees of the French Revolution to both Presidents Roosevelt, to Winston Churchill, to Benjamin Parker, it is known that with great power, there must come great responsibility. This is why, alongside the fundamental rights guaranteed by the Constitution, are a set of responsibilities for each and every citizen. The responsibilities of the citizens are listed in Article 1, Section 2 and include demands made by the community onto the citizen in order to ensure that democracy, which at the same time allows and requires popular participation, may function. These include: the obligation to get an education, to vote, to pay taxes, to act responsibly towards the environment, and to be acquainted with institutions, civic rights and responsibilities. The section also encourages the creation of a paid public service to foster solidarity. Turn to our Q&A to read more about the responsibilities of the citizen and why voting is compulsory. Citizen involvement and empowerment is a core reason we need a new Union and this Constitution; read more about why we need EU reform. In a federal Europe, as in most political systems, the portfolio of policy issues is divided among Ministers. Ministers are appointed by the Prime Minister at his discretion and not along State lines. The tenure of the Cabinet ends with that of the Prime Minister and, in any case, with new elections. Article 3, Section 3 establishes the Cabinet of Federal Ministers and gives details on its nomination process. Article 3, Section 4 lists the prerogatives of the Prime Minister and his Cabinet of Federal Ministers. powers at the federal and State levels. Beyond the Cabinet, read about all institutions of the federal Union. What are the federal institutions? The two main goals of a constitution are to present our principles and values, and to design institutions best-suited to uphold them. This includes the various organs involved in decision-making and the voting mechanisms. With our stated values of democracy, transparency and efficiency, the institutions we propose match democratic, transparent and efficient institutions one could already find at the national level. In line with the principle of separation of powers, Article 2 establishes the legislative branch, in charge of adopting laws; Article 3 establishes the executive, in charge of implementing the law; and Article 4 establishes the judiciary, which ensures the respect of the law and its compatibility with this Constitution. Our Q&A details the institutions contained in the Constitution, as well as a summary of who does what. You can also read a more details presentation of institutions of the federal Union and how they compare with current institutions. as well as what the powers are at the federal and State levels. The EU already has a central bank to manage its monetary policy. The Constitution empowers Congress – as the representative of the people – with monetary prerogatives but entrusts them to an independent federal Central Bank with a strong mandate. As part of the powers entrusted to Congress by Article 2, Section 7 is to issue money, regulate its value and adopt monetary policy. The Constitution explicitly mandates an independent Central Bank to carry out this mission on behalf of Congress. The Central Bank's mission includes supporting employment, stabilising prices, moderating long-term interest rates, as well as preventing, addressing, and mitigating the effects of financial, monetary and economic crises. Beyond the Central Bank, read more about the institutions contained in the Constitution, powers at the federal and State levels, and why the Constitution is so short.